Muckman is the only person I know that still may be able to find one. I hadn't seen one since we got it for this car back almost 10 years ago. Lovefab also has a sidewinder version. Or find a good fabricator willing to make you a copy. Just build your own. That's what I did. Cost me about $400 in materials and whatever it was to run the welder and air compressor. Although I don't recommend them, I purchased a ramhorn manifold kit from Mazworx and added 4 feet of straight tubing. You would be better off sourcing the pipe from Ace Stainless and getting the flanges from wherever (eBay). 5 grand. That's insane. Burns collector or not what a waste of money. Def make your self or find a good fabricator. I own a burns collector. Good stuff but I did not think they cost that much. But why do you want a sidewinder? unless you plan on running air to water like TheShodans photo there isn't much benefit. the long runners are good for top end power but response does suffer a bit. best thing to do is ceramic coat it or heat wrap it. then there's the custom radiator hoses, radiator and fan clearance issues. so why then? if it's just to look cool or different then you're doing it wrong. If the entire setup is built right you don't lose much response at all. If the manifold is built right you can use stock hoses and stock radiator with a slim fan. I don't think it is cool at all to have one more like a PITA, but function over form in my book. If it looks cool while doing it then so be it. In the end it really depends on the chassis and purpose of the car. I had plenty of room to play with in my RD1. Yea the main advantage is very short charge piping. if you use an air to water setup like posted above you have about 18 inches of total piping length. if you use an air to air setup you can use a super efficient horizontal flow interccoler with same side inlet and outlet with about 3ft of piping. so any response loss by the long runners is almost entirely made up for by the short charge piping. 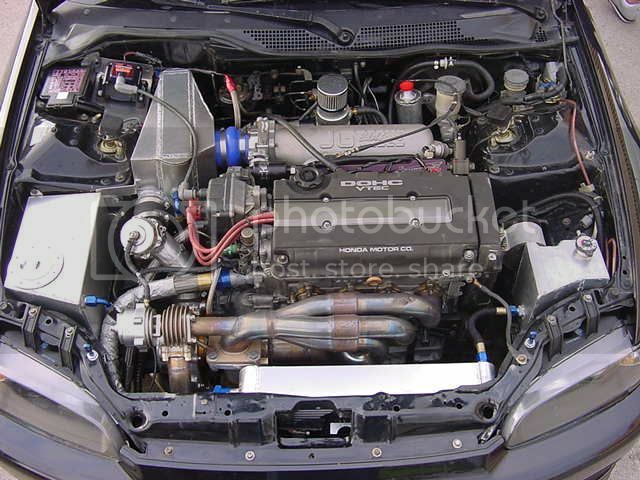 Turbo GSR; Precision 580cc injectors and Walbro 255lph fuel pump?